The Baal Shem Tov taught that one should endeavor to apply everything encountered to one's service of G‑d. This message flashed through my mind, and so I attempted to find a lesson for what I was witnessing. It did not take me long to realize that there is much to learn from an airplane on "final approach". In most instances, for the duration of a flight the aircraft is in "auto pilot," during which time the crew does little except to baby-sit the flight computer. An occasional glance at a gauge or dial, check of the charts and maps, and maybe a passing pleasantry with an air traffic controller whose airspace is being traversed, is practically the extent of the crew's role. With the exception of some bad weather, mechanical malfunction, or some other unforeseen circumstance, the routine is relatively simple. However, the final approach is a different story. Airspeed, altitude and alignment are meticulously checked and rechecked. At that critical juncture, nothing is taken for granted, and the crew's full concentration is necessary. For the 3,300-plus years of the Jewish national existence, our course has been clearly plotted. Along the way, we Jews have experienced quite a bit of turbulence; however, the course has remained ever constant. Individually and collectively, we must now consciously confirm that we are properly aligned. We must be careful, as there are powerful cross winds at work — negative forces and various forms of resistance that complicate our safe arrival. Now is the time to ensure that the entire airplane is in a state of "All Systems Go!" Although there is extra effort involved with a manual operation of the airplane, everyone will agree that it is well worth the extra effort to ensure a safe arrival. We are, after all, speaking of the Messianic Era. A time of universal peace and brotherhood. A time of complete emancipation for Jews the world over. A time when all of our material needs will be met without worry and aggravation. Disease will be eradicated, as will poverty and other evils. We will finally be able to focus all of our attention on what is really important. A time when, in the words of the prophet (Isaiah 11:9), "the earth will be filled of knowledge of G‑d as the waters cover the sea." The Moral Compass On a flight to a small farm town in central Ca. I had punched in the coordinates on the GPS for the small airport and tracked the course manually (no auto pilot I'm Otto). As the airport neared I heard airplane traffic on the common freq. 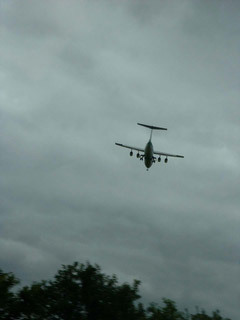 but did not see the traffic when it was supposed to be on a short final and I was on a close downwind. I thought that it was like the twilight zone. I landed on the pot holed dilapidated asphalt tarmac not a soul to be seen I taxied over to a large WWII type hanger as walked in and I realized I must have entered some kind of time travel, the hanger was full of old war planes being worked on by a lot people that took no notice to my sudden appearance. I had to loudy vocalize my presence and ask if was at the inteneded airport and as they responded yes but you are most likley looking for the new airport with the same name, it is 2 miles to the west. It was on a new chart that I did not have but the freq's were the same.